The European Union and Britain have agreed on the terms of a post-Brexit transitional period, EU chief Brexit negotiator Michel Barnier said Monday. With Britain set to exit the EU in March 2019, the transition period is meant to provide companies and citizens with certainty right after Brexit and allow enough time for Britain to put post-Brexit systems in place. The agreement foresees keeping all EU rules in place in Britain until the end of 2020. 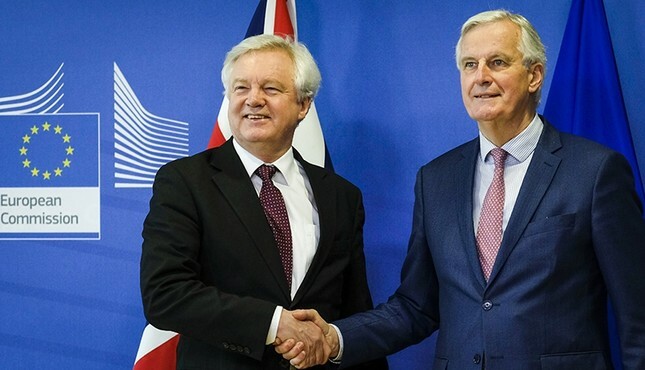 "The period of transition requested by the United Kingdom will be a time which is useful, very useful, for the United Kingdom administration and businesses in order to prepare themselves for the future," Barnier said. British envoy David Davis hailed the progress in Brexit talks in recent days as a "significant step" toward a final deal. He also said the two have agreed to set up "a joint committee" to resolve any disputes during the two-year transition period. The parties also agreed that there must be a "backstop" solution to ensure that there is no hard border between Northern Ireland and Ireland, according to the draft text of the Brexit treaty published Monday. The border between EU member state Ireland and Britain's territory Northern Ireland issue is central to an agreement but negotiators are struggling to find a way to keep people, goods and services flowing while respecting EU controls. Dublin is concerned at London's rejection of a "backstop" arrangement set out as a separate protocol in the EU's draft of the withdrawal treaty. Under this, Northern Ireland would effectively submit to EU economic rules and so become potentially isolated from the British mainland. "With respect to the draft protocol on Ireland/Northern Ireland, the negotiators agree that a legally operative version of the "backstop" solution for the border... should be agreed as part of the legal text of the Withdrawal Agreement, to apply unless and until another solution is found," a preamble to the draft text said. The text made clear that Britain had not agreed to the specific proposal made by the European Union. Meanwhile, a group representing European automakers urged the Brexit negotiators to urgently address issues affecting the auto industry and to prevent "potentially disastrous implications" for its supply chain. The European Automobile Manufacturers' Association, or ACEA, said it's concerned about whether cars approved by U.K. authorities can still be sold in the EU after Brexit and vice versa. It called for both sides to recognize each other's vehicle approvals.